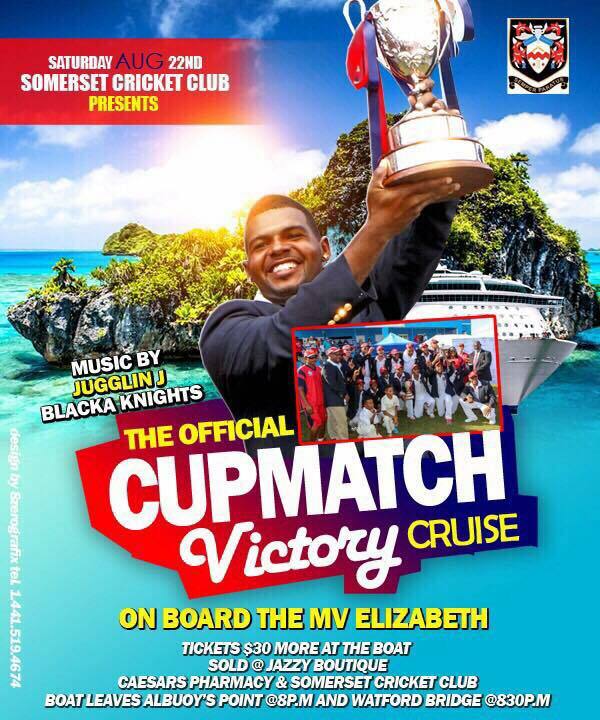 Somerset Cricket Club is inviting the community to join them for the continuation of their Cup Match celebrations, including a cruise tomorrow [Aug 22] and the annual prize presentation on August 28. The official Cup Match Champions Cruise will take place on Saturday, August 22 on board the MV Elizabeth, with entertainment provided by DJ Jugglin J and Black Knights, with the boat leaving Albuoy’s Point at 8.00pm and Watford Bridge at 8.30pm. Tickets for the cruise are $30 in advance, or more at the boat itself. The annual Cup Match and Colt Cup Match Prize Presentation will take place on Friday, August 28 at 8.00pm at the Somerset Cricket Club, with guest speaker Dwayne “Sluggo” Leverock on hand. To donate prizes or for more information, contact Dawn Simmons on 705-2665 or email secretary@sccbermuda.org. What’s wrong with you, Somerset? That island in the poster isn’t even in Bermuda. Clearly Ya not from Somerset. That little island is in Elys Harbour.